Glaucoma is a disease that can cause vision loss often without warning or symptoms. Glaucoma is the second leading cause of blindness in the U.S. and the leading cause of preventable blindness. This disease can occur at any time, but becomes increasingly more prevalent with age. 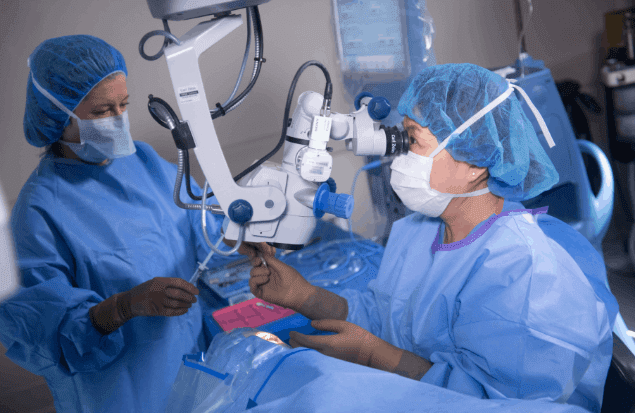 Our board-certified, fellowship trained glaucoma doctors provide expert diagnosis and the latest in techniques and technology to treat glaucoma. Our doctors listen carefully to your concerns and will provide you with a plan customized to your unique symptoms and your needs. Glaucoma is a very serious condition with life long implications if left untreated. Our fellowship-trained, glaucoma specialists are ready to help you diagnose if you have glaucoma and provide a treatment plan using the latest in scientific breakthroughs and technology. There are many types of glaucoma but they all have one thing in common, damage to the optic nerve. Because glaucoma can be difficult to detect, we highly recommend early screening. Treatment varies depending on the severity of the glaucoma. Our specialists can help you determine the best course of treatment for your condition. Speak to a glaucoma specialist today 770-427-8111. The board certified and fellowship trained glaucoma doctors at the Marietta Eye Clinic provide expert care for this serious disease. Learn in this video about the symptoms, causes, types, and treatment options for glaucoma. Learn why surgery at the Marietta Eye Clinic's outpatient surgery center is a wise decision.